As promised, here are some photos of the new studio set up. 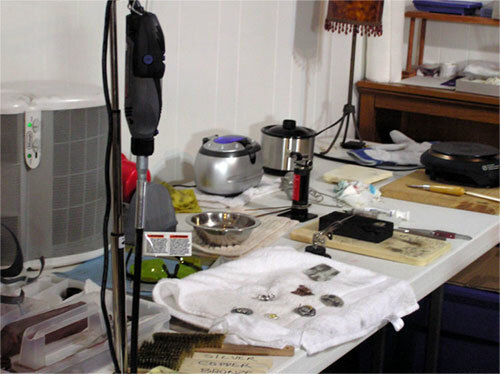 I cleared some room to have a separate table to set up my mini photo studio, so now I have three 6′ tables to work with for everything else: metal work, metal clay, collage, soldering, polishing, tumbling, keum-boo, and heat patination. Roomy! 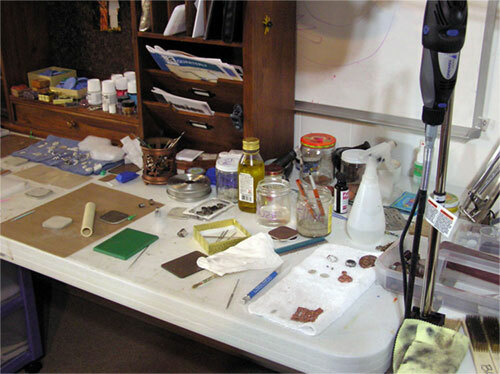 Next is the table where I do all the soldering, polishing, patination, and keum-boo, which is a Thai technique for adding layers of gold to fine silver. Here you can also see other tools for tumbling, pickling, and cleaning metals. Since keum-boo and certain type of patination require direct heat, I use a hot plate. Someday I will be able to get a sturdy wooden table to add safety to this station, but for now it has to be plastic. I set the hot plate up on a thick piece of wood to prevent burning the table! 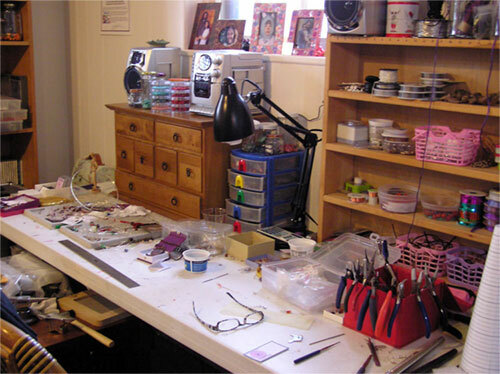 Below you can see the hot plate and the bookshelf where I keep patinas and some packaging materials. I don’t use liver of sulphur for patinas here, I do those in the bathroom, where there is running water. 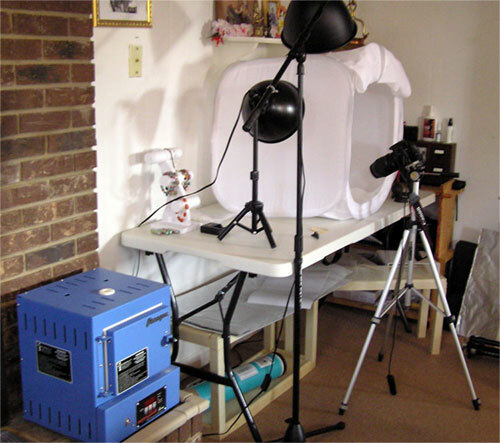 Finally, here is the new mini photo studio. Now I have more room to move around and play with lights. I even have room for all my photo accessories and props. I am loving it! You can see my metal clay kiln above. I placed it by a brick wall (the fire place), since it seems the safest spot for the amount of heat that kiln can kick. Thanks for reading this far. Hope you enjoyed my virtual jewelry studio stroll! Now THAT is a studio. I had recently bought a used table on craigslist and mine is now a little less organized and a lot smaller, but you have given me some great idea on what I can do with my space. I will post a few pics of my studo in one of my future blog postings. Depends on how long it will take to get it straigtened up. Thanks for your comment. Glad to hear it gave you some ideas. 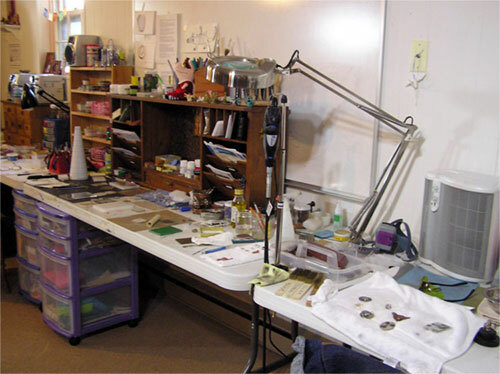 I tried to place things so that the space would be better utilized, so certain tools can be shared for different aspects of the jewelry making process. It?s really a cool and useful piece of info. I?m happy that you simply shared this useful info with us. Please keep us up to date like this. Thanks for sharing. do you know about chemical polish? Hi there, just wanted to ask where you bought that shelving unit on top of your table. It’s the tall one. I’ve been looking for this for awhile but I don’t know what it’s called. If you are referring to the light colored one, it’s an unfinished CD storage unit that I purchased years ago at one of those unfinished wooden furniture stores. So it’s narrow and portable, and it holds small stuff nicely. If you are referring to the darker, longer unit, it’s a desk hutch from Pottery Barn.